Since February, Americans have become less and less confident about the economic future of the country. 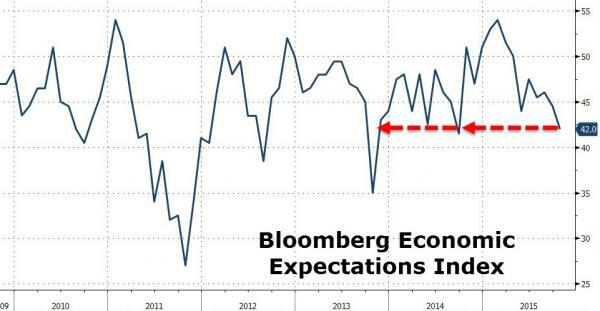 As Bloomberg reports, National Economy Expectations tumbled to 42.0 - just above Sept 2014 lows and almost as weak as during the 2013 government shutdown. 2015's weakening streak is the worst consistent drop since 2011 (which unleashed moar QE) as Americans' spending attitudes tumble the most since May. Thirty-nine percent of respondents said the U.S. economy was getting worse, up from 36 percent in September. Some 23 percent said it was improving, the smallest share in 13 months. The report stands in contrast to the University of Michigan’s preliminary consumer sentiment index, which advanced to 92.1 in October from 87.2 a month earlier. The decrease is seeping into Americans’ attitudes about spending. The buying-climate index, which measures if consumers think it is a good time to purchase goods and services, fell by 2.3 points to 37.2, the largest weekly decline since May.